DemoCurmudgeon: Bumbling AG Schimel can't win 20 state ACA lawsuit based on facts! Bumbling AG Schimel can't win 20 state ACA lawsuit based on facts! Kaul is right of course. Yet Republican AG Brad Schimel considers it a "harmful effect" covering 195,000 more Wisconsinites with healthcare insurance? First, it's TrumpCare now! TRUMPCARE: The ACA's changes under Trump have forced even deep red states like Wisconsin to spend even more money to try and save it. Walker, an avowed opponent of Obamacare, signed a bill into law that will position the state to receive $150 million in federal dollars to help shore up its healthcare marketplace ... set up a $200 million reinsurance fund, 75 percent of which would be paid for by the federal government. “Obamacare causes premiums to rise and coverage to fall, forcing Wisconsin and other states to take extreme, costly measures to protect their citizens’ health and pocketbooks.” Schimel said that Obamacare has ... cost the state jobs. 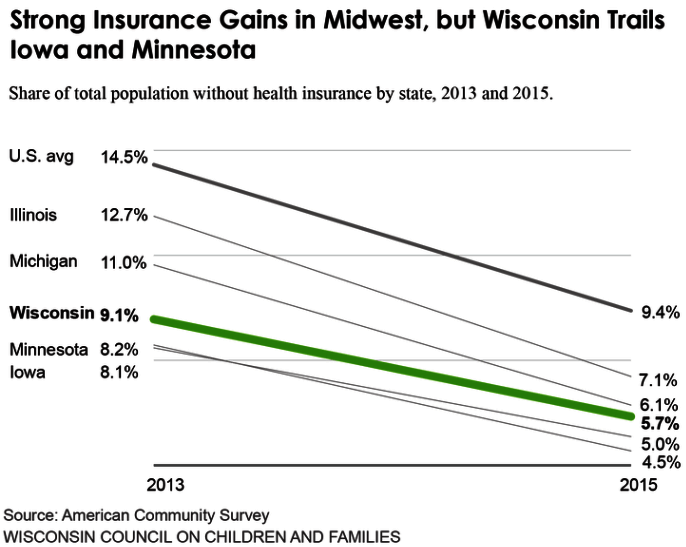 "Josh Kaul may not have known this since he was living on the East and West Coasts, but prior to Obamacare, Wisconsin had among the lowest rate of uninsured people in the nation because of a vibrant free market and a successful high risk pool that provided options for those with pre-existing and serious medical conditions," he said in an email. 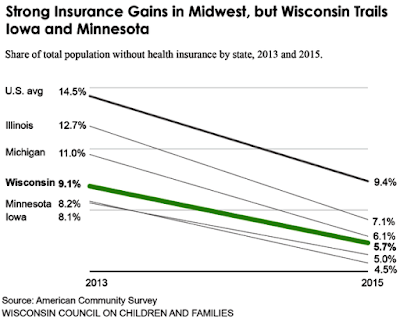 Wisconsin's low uninsured rated was the result of a Democratic policy allowing BadgerCare coverage for everyone up to 200 percent of the federal poverty level (FPL). Both Walker and Schimel want to take credit for the resulting Wisconsin ranking on coverage. Nope, can't do that. Walker then cut eligibility in half, from 200 percent to 100 percent, leaving those with no discretionary income to buy into the ACA Exchanges. Wait, Schimel's concept of "successful high-risk pool's" is pure fantasy. Losing $6.9 million in one year is considered a success? Wisconsin's high-risk pool insured about 21,000 people, with critics saying high prices kept tens or hundreds of thousands of others from accessing it. Those applying for the program had to wait six months before they were allowed into it and a lifetime cap of $2 million. Health Insurance Risk Sharing Plan lost $6.9 million in 2011, roughly a third of which was offset by a federal grant, according to the Wisconsin Legislative Fiscal Bureau. The same year, programs in the 35 states lost a total of at least $272 million. The "harmful effects" Schimel trashed Josh Kaul with have numbers and are pictured here, on the left side of the graph. And Schimel is leading a 20 state lawsuit to repeal the ACA with examples like this? “I think it’s probably more of a privilege. Do you consider food a right? Do you consider clothing a right? Do you consider shelter a right? What we have as rights is life, liberty, and the pursuit of happiness. Past that point, we have the right to freedom. Past that point everything else is a limited resource that we have to use our opportunities given to us to afford those things.